Take that, fascists! If you promote a hateful, racist agenda, there’s no way you’re going to get to eat dinner at a restaurant that only serves breakfast and lunch. 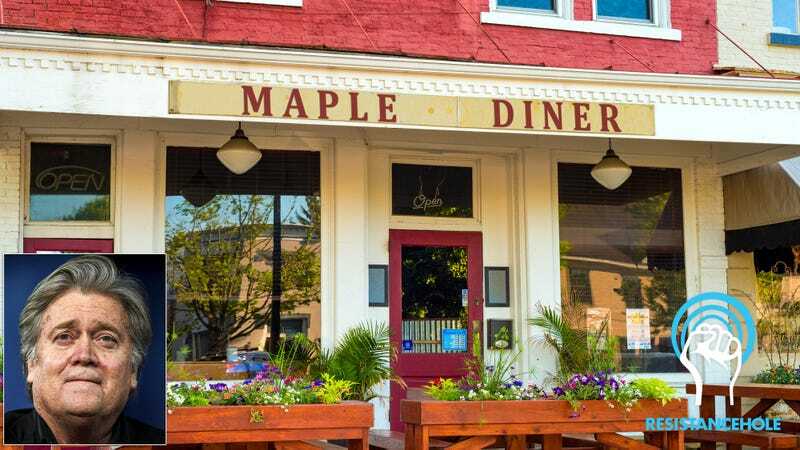 Imagine the look on Steve Bannon’s face when he grabbed the doorknob of the Maple Diner after 7 p.m. and discovered that the door was locked. Bannon no doubt regretted helping Trump get elected when he glanced through the window and saw that the lights were out and all the employees had gone home, leaving him without a meal. As an extra-sassy insult to Bannon, the restaurant owner had even flipped the “open” sign on the door around to the other side so it said “closed.” So perfect! Trump supporters, you’ve been put on notice because the hours of operation are listed on the diner’s website and they clearly say 6 a.m.-3 p.m.
Breitbart is no doubt going to throw a hissy fit and write an article complaining about the restaurant’s uncivil behavior, but conservaturds like Bannon have to learn that actions have consequences. When your political policies hurt people, you simply don’t deserve to eat at a restaurant that isn’t open at the moment. And Steve Bannon better not even think of trying to eat there on Thanksgiving or Christmas because the restaurant isn’t open at all on those holidays. Sorry, Steve, but that’s just the way it is! Resistance win!